A whole array of pressing issues, covering Iran, Syria and Lebanon, has topped the agenda of Benjamin Netanyahu's talks with Russian President Vladimir Putin during the Israeli Prime Minister's working visit to Moscow. Russian President Vladimir Putin has presented Benjamin Netanyahu with an authentic letter written by Oscar Schindler, a Nazi party member who saved the lives of more than 1,000 Jews by recruiting them to work in his Polish factory during World War II. "After the [two's] meeting, President Putin presented Prime Minister Netanyahu with a gift. This is the original of Oscar Schindler's letter to his wife. The head of the government was very touched by this gift, timed to the International Holocaust Remembrance Day," Netanyahu's press secretary Anna Jonathan-Leus said. She added that Netanyahu intends to hand the gift to Yad Vashem, Israel's largest Holocaust memorial located near Jerusalem. 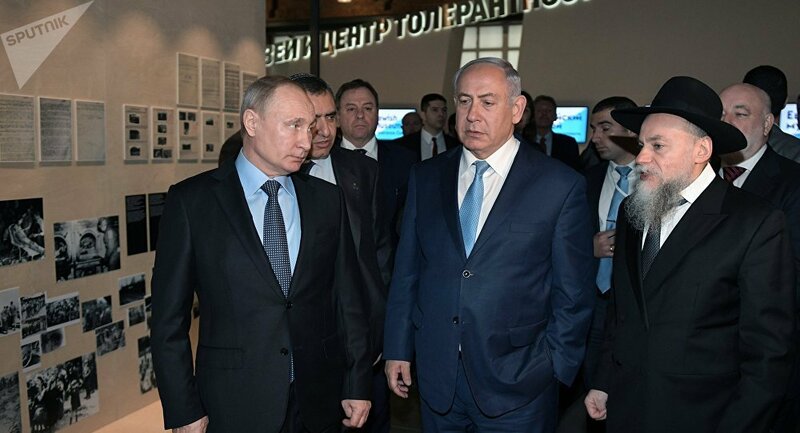 — Yiddish News (@YiddishNews) 29 января 2018 г.
Jonathan-Leus's remarks came after Netanyahu visited Moscow on a one-day working visit to meet President Putin and discuss a spate of bilateral and international issues, including those pertaining to Syria, Iran and Lebanon. During the visit, Netanyahu pledged that Israel will never forget the contribution made by the Soviet Union to the defeat of the Nazis. Putin, for his part, praised efforts by the Israelis to preserve the memory of the Soviet soldiers who had rescued European Jews from complete annihilation.